Abdullah Ibrahim held the audience of Salle Gesù spellbound during his solo piano recital. Completely acoustic, with no microphones, the South African pianist and composer performed two blocks of music – one 50 minutes without interruption, and a second shorter medley of 25 minutes. One could hear a pin drop as the audience gave Ibrahim the attention he so firmly deserved – in fact, the coughs and chair movement were at times louder than his instrument. 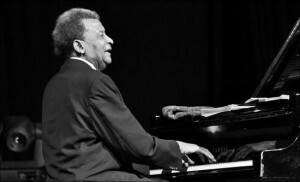 Ibrahim is a member of the jazz piano lineage that descends from Duke Ellington and Thelonious Monk, down through Randy Weston and Jaki Byard. While the themes were often melodious in the manner of gospel and township jive, they were framed with elements of boogie-woogie, blues, and densely angular flurries of notes. At a few points – the rolling build of gospel chords, a delicate whisper of half notes – his piano sounded like a choir. Ibrahim explored his own library of compositions in stream-of-consciousness fashion, with snippets of melodies appearing and receding into improvisation, only to surprisingly materialize again. Ibrahim was very much indulging in the sound of the piano, of the room, and of his music. He would repeat phrases and let chords linger, every cadence a possibly cathartic ending that he pushed through with more invention. The second segment of Ibrahim’s set began with some crunchy Ellingtonian harmonies with the melodic contour of a classic swing riff. There were playful staccato passages, bearing similarity to the kids running on the huge toy piano on the esplanade of Place-des-Arts. The final piece he explored was solidly in D minor, but in the Bach tradition, ended on the major chord. After one of his many deceptive cadences, Ibrahim repeated the melody and let that simple D major triad ring in complete finality. He acknowledged the standing ovations that followed each segment, and even returned for a second bow, but he did not play again. No encore was necessary – nor possible. This entry was posted in Reviews and tagged abdullah ibrahim, montreal jazz fest on July 3, 2015 by CKUT Music Coordinator.